No privacy by design. Thanks to default cloud settings, BlackVue dashcam customers may be live-streaming video and audio from their vehicles, as well as having their location mapped. Just as some people are unknowingly streaming live video from security cams in their homes, some are also unknowingly live-streaming video from their cars. They have made the video feed from their front and rear dashcams, as well as the mapped GPS location of the vehicle – the speed it is going or if it is parked – and even audio from inside the vehicle, available to the public. Let’s assume you dropped around $400 or so for a BlackVue dashcam, which includes “Over the Cloud” capabilities. That’s what IT pro Tim Woodruff – who is a software architect and developer for IT service management software, a former pen tester, and author – did after a semi hit his new Tesla Model X and insurance refused to pay even though the driver admitted to not seeing the Tesla. Installation and all cost him a whopping $1,200. 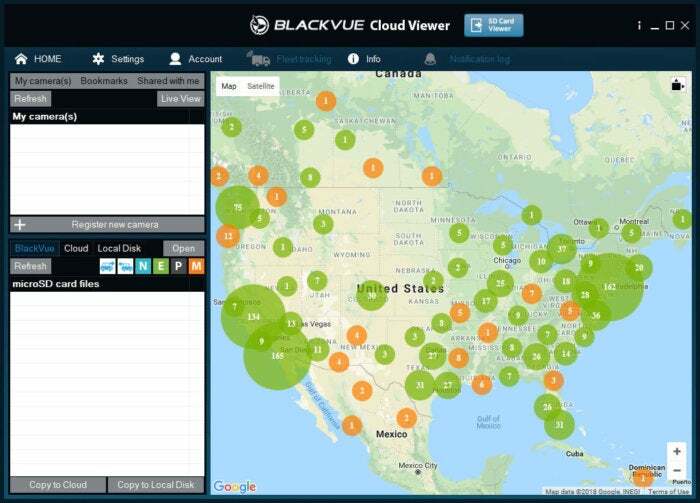 BlackVue comes with a Cloud Viewer which allows owners to see a live view of their car. However, Woodruff warned that thanks to a sketchy registration process, that live view is available to the public. Users are opted-in by default to share the precise GPS location of their vehicles on a map, as well as a stream live video feeds of the front and rear cameras. Do you really want to broadcast a live feed of where you go, of the inside your garage, or where you drop your kids off at school? Do you ever do anything you might not want the world to know, such as visit a head shop, an erotica store, seek treatment at a medical center, or even visit the person with whom you might be having an affair? As a software developer, he decided “the BlackVue software configuration process and user experience is probably the worst and most poorly designed” that he has ever seen. Furthermore, he believes it was “sheer unadulterated incompetence that lead to this massive breach of their customers’ security and trust” as opposed to purposeful maliciousness. @BlackVue They should not *BE* the default privacy settings. Are you new to the internet or something? It's bad enough when the default is "share all my information with [company]", but if it's your live GPS and camera view from inside your car, PUBLIC SHOULD NOT BE THE DEFAULT. Woodruff explains the problem and even includes live dashcam video feeds from other people’s vehicles in the video below. Audio, too? It is an option in the camera’s privacy settings, as is publicly sharing location, video, and camera name. I suppose if you needed proof, enabled audio along with the camera is one way to go – as seen by a Tesla Model 3 owner who got pulled over because the cop said he couldn’t have the computer mounted – not realizing the center console is standard in a Tesla. In the below video, Woodruff shows the “deceptive” registration process. By sharing your Live View you can let other users vicariously experience the excitement and pleasure of driving all over the world. However, as personal video may be transmitted you should take special care in deciding what information you share. He goes on to show that if you were to register your BlackVue dashcam and then disable the cloud settings that made your dashcam video feed public, then unregister the cam, and then re-register it again, you are automatically opted back into the public settings. Does this violate GDPR or other privacy laws? If you got a BlackVue for security, surely you can see that the public sharing of your information can also make you less secure. After downloading the BlackVue Windows Viewer software (last updated today Oct. 2), I could indeed see the location of many vehicles with BlackVue dashcams on a map. Scroll in tighter and it shows things like how fast the vehicle in going or if it is parked. For the green ones, I could see the name of the camera or the specific names assigned by owners such as Tesla S or Honda with even more identifying information than I was willing to screenshot and share. I could not, however, see the live video feed without logging into my account or registering my BlackVue. To be clear, what I could see was available to anyone who downloads the software, as I don’t have a BlackVue or any other type of dashcam. At the time of publication, BlackVue had not responded to my request for comment. 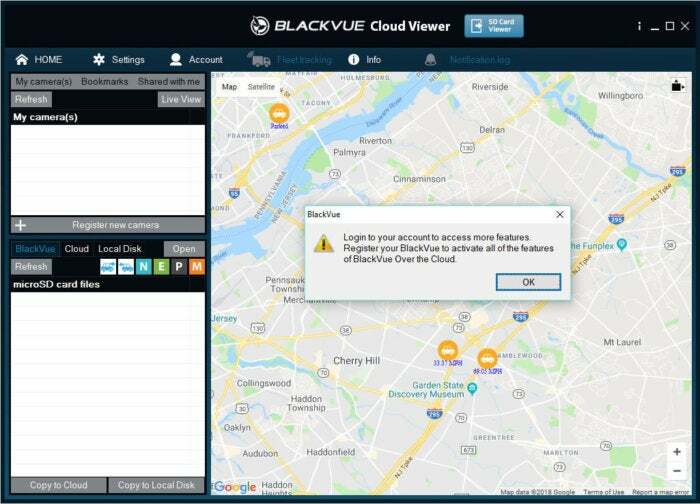 You can find more information about how to change, hopefully to disable, the BlackVue GPS location sharing via the cloud on BlackVue's Help Center page.